From an early age, Jay Fagen’s favorite place has been in the middle of a build. He gained his passion for building dreams, whether it’s a house remodel or a new build, when his parents built a family home in 1973 in Humboldt. Fagen was just born when this house was built. By age eight, Fagen was helping his dad with construction projects by sweeping and cleaning. “At 12, I was working alongside my dad and his crew – I was one of the ‘guys,’” Fagen said. "Although, sometimes I had to mow the grass." 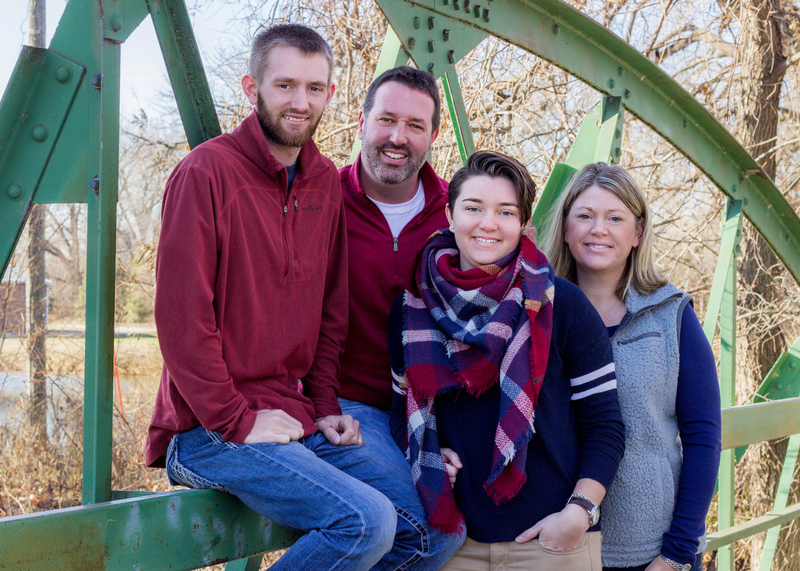 Over the years, Fagen continued to work alongside his dad doing construction, gaining valuable experience with his dad as a business man or working with his foreman on the job. “My dad gave me good work ethic, you don't quit until the job is done,” Fagen said. In 1994, Jay and Laura Fagen were married and the couple established their home in Spirit Lake. Jay and his father built spec homes. Several years later, Jay stepped out on his own and created Fagen Construction. Laura then handled all of the painting. He has built countless homes around the community since 1996, including seven homes he has built for his family. A few years ago, a home Fagen was building for his family was spotted by a passerby. They peeked in the windows during construction and fell in love with the home on Center Lake. Fagen ended up finishing the house in their style for them and they bought it at completion. Fagen Construction is known throughout the Iowa Great Lakes area for being dependable and hard-working. This family-owned business helps countless homeowners improve or build garages, remodel kitchens or baths, or transform a home. Fagen has also built beautiful homes for numerous families throughout the area. He has built homes from 1,200 square feet all the way up to a 10,000 square foot home. “We really enjoy transforming your home into a space you want to be in all the time,” Fagen said. Jay and his son Austin, along with several subcontractors, are always in the middle of a project. For instance, for some people it’s adding on bedrooms, creating add-ons to an exterior porch, renovating an attic or remodeling secondary floors. Other times Fagen Construction enjoys the challenge of starting from scratch, from the initial design and permit phase all the way to the last nail. “One of my favorite parts about a build is thinking outside the box and problem-solving,” he said. Some of the remodels homeowners are thinking about having done seem to be a simple change. The simple change could turn into a few larger changes as they get into the project. For example, a homeowner would like to open up a room and take out a wall. However, the challenge takes place when the wall is a load-bearing wall. One of the aspects Fagen really enjoys about building is meeting with people. “I enjoy getting inside their minds and work hard to see what they’re envisioning,” he said. However, this process isn’t always the easiest and he recommends the homeowner to always communicate their thoughts and desires. This allows him to add professional perspective for estimates and protect against potential project overruns. During Brad and Susan Travis’ home build in 2013, the couple had envisioned a walkout basement. While Fagen was digging out the base, he understood something different and the walkout wasn’t in his plan. This created a dilemma but one Jay took in stride and a walkout basement was built. Fagen Construction broke ground in 2014 and finished a gorgeous home in 2015 for Travis and Melissa Van Genderen. Four years later, their family has changed and their dining space needs enlarged to fit their growing family, enlarging the northwest corner of the home. “I got a call from Travis Van Genderen and he said 'Jay you know that spot you really liked to sit at off of our kitchen. Well we do too, we need to make it larger and our permanent dining area,'" Fagen recalled. Jay is a part of every home remodel or new build, from start to finish. He enjoys every aspect. His son Austin works closely with him, continuing on the family tradition. He brings in an additional specialty with his certifications in welding. His wife Laura continues to help with painting projects, and when his daughter Josie is home she likes to be apart of the family business along with assisting with high school softball. Jay hires very talented subcontractors when he needs extra help. “I have a master craftsman I hire; the man can do anything. There isn't a staircase or a cabinet that this gentleman can't figure out how to build,” Fagen said. Fagen Construction completed a lake home build in July 2018. The past few months, while still working on a spec house, they have also been working on a number of home remodels and additions. In the last couple of years, Jay has helped his father out with epoxy and/or metallic coated floors, which have became very popular in the lakes area. Jay's father has been doing this type of flooring for 25 years and at 72-years-old he appreciates the help especially on the larger jobs. They have completed jobs from 200 to 80,000 square feet. This type of flooring is a great accent to one's personal home. Fagen Construction can handle any project large or small from start to finish. They help you create your ideal kitchen, bath, home or even outdoor space, whether it’s transforming the space with cabinetry, appliance, flooring, tiling, countertops, decks, or railings. Other home remodels involve putting in new windows and doors, adding a garage or updating a bathroom. Jay and his crew at Fagen Construction love bringing dreams to life. For more information on Fagen Construction, visit www.fagenconstruction.com or contact Jay at 712-320-1355.